Golden Ocala Golf & Equestrian Club is your oasis to live a relaxed lifestyle. Indulge in the lavish amenities of the spa, bask in grandeur at poolside, or partake in a leisurely stroll along the breathtaking equestrian trails. Enjoy the quiet of the Governor’s Room in the clubhouse or the tranquility of the Spa Garden. The natural beauty of Golden Ocala features majestic Oak trees, scenic water views and varieties of birds and other wildlife. The serene environment is an ideal setting to unwind and enjoy life at your own pace. Let the Golden Ocala Spa staff schedule your day of pampering. Select a variety of spa services like a soothing massage in one of the luxuriously appointed treatment rooms followed by a rejuvenating facial. Spend time in the Spa Garden to enjoy the peaceful environment. Be sure to include the spa as a part of your overall relaxed lifestyle. The full salon at Golden Ocala offers a variety of professional services. Hairstyling and coloring are available for both women and men. Pair a pedicure and manicure with your salon visit and enjoy a delicious lunch in the Spa Garden or at Café on the Green. Spend your entire day being pampered at Golden Ocala. The sparkling clear pool at Golden Ocala can cool swimmers off on sunny Florida days, help you stay in shape as part of your fitness routine and be the backdrop to lounge and unwind. 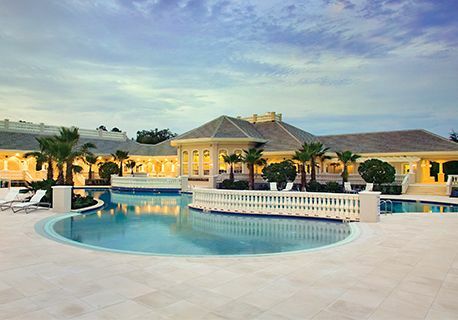 The sprawling zero-entry pool allows for easy-access for both adults and children. A host of amenities are available poolside including beverage and food service. Golden Ocala features an 18-hole championship golf course which includes tribute holes from some of the world’s finest courses, including Augusta National, Muirfield, Royal Troon, Baltusrol and St. Andrews. The course has hosted the LPGA Tour, as well as major amateur tournaments. Improve your game on the state-of-the-art practice facilities featuring a 6-acre short game area. You can enjoy private lessons or join friends to tee-off with you. The quiet and seclusion of Golden Ocala makes it a perfect walkable community. 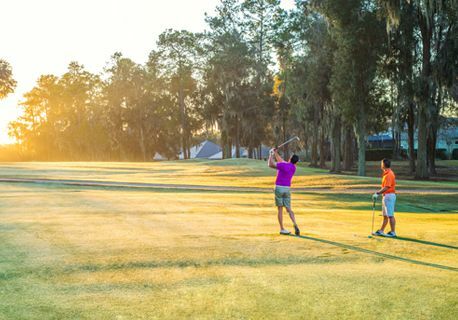 Enjoy scenic views of Golden Ocala’s rolling hills and glimpses of the pristine 18-hole championship golf course while taking a stroll around the community. Walk over to the clubhouse for dinner, or to the Fitness Center for a workout, or join a group walking the neighborhood to stay fit. Golden Ocala Golf & Equestrian Club is situated on more than 1,200 acres of picturesque rolling hills. 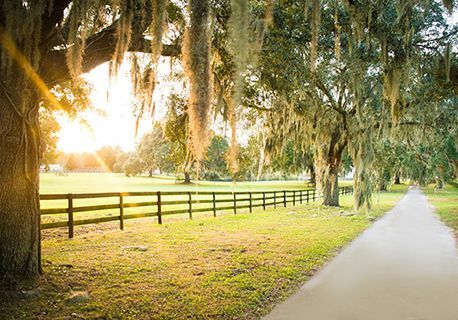 Be captivated by the equestrian trails shaded by beautiful Oak tree canopies. Cherish the views of native birds and other wildlife on the property. Ride our peaceful equestrian trails and witness a stunning view of the lake. The natural beauty of Golden Ocala is unparalleled.